Following the success of Farm Heroes Saga on Facebook, casual game company King has brought the experience to iOS and Android devices. The game offers cross-platform play for users to pick up their progress wherever they are, with each match-three level asking players to collect cropsies (animated carrots, onions, water droplets and more) before running out of moves. While the overall goal of each stage is to collect specific amounts of certain cropsies, the level designs and goals for each stage become increasingly complicated over time. Eventually, special symbols including birds, flowers and water buckets are added to the game, encouraging players to use power-ups to clear difficult challenges. Power-ups include shovels for removing a single symbol, wheels which clear an entire row, and a dog that collects all cropsies of a single type, among others. These are offered in small quantities for free, or can be purchased with real money. 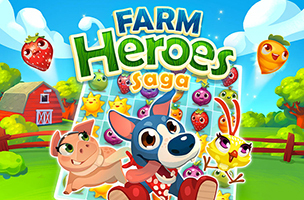 The mobile version of Farm Heroes Saga offers the game’s first 160 levels, so Facebook players who have progressed farther than that will still need to wait a bit before progressing on mobile. Past levels can still be played, however, to increase high scores, unlock more farm animals or earn more stars. Farm Heroes Saga is now available to download for free on iOS and Google Play. Check back soon to follow the game’s progress on AppData, our tracking service for mobile and social apps and developers.